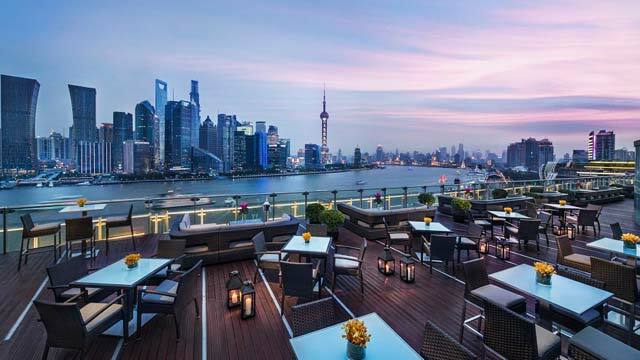 A complete guide to the 9 best rooftop bars in Shanghai in 2019. A list with all information you need about each roof terrace. Opening hours, dress code, pictures, maps and much more. 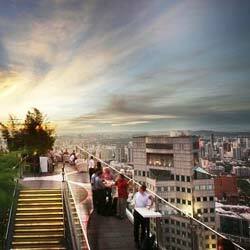 The biggest city in China has some of the very best rooftop bars in the world. 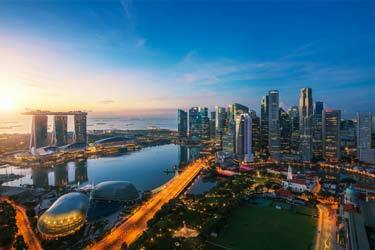 A typical big Asian city with lots of skyscrapers and a warm and long summer. Most of the rooftops here are located in the Hangpu District, offering breathtaking views over the modern and iconic Pudong skyline. 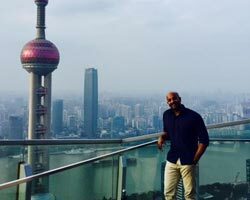 So, which is the best rooftop bar in Shanghai? 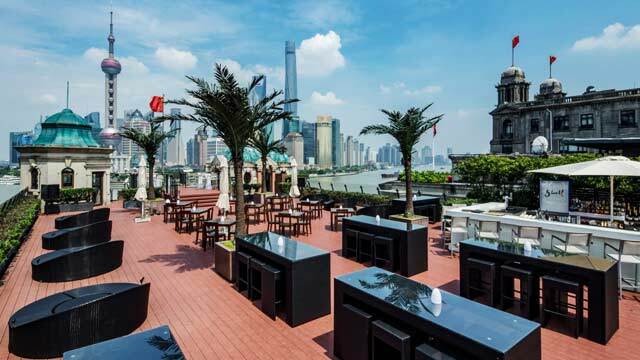 Just scroll down and find the Shanghai rooftop bar best suited for you. Or use the Shanghai rooftop map in the bottom right corner. 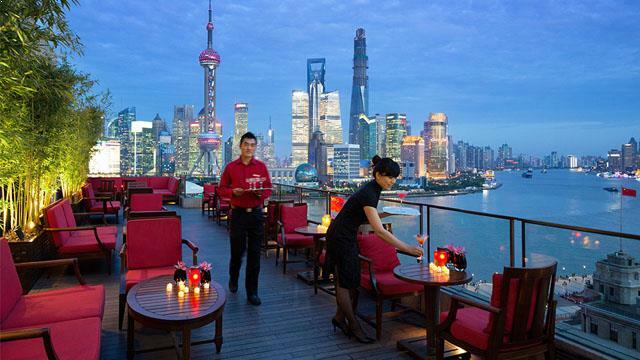 The luxurious hotel Peninsula in Shanghai offers both fine dining and drinks with a fantastic view. On the 13th floor you find Sir Elly's Restaurant and one floor up is the appurtenant Sir Elly's Terrace, with a prime location right on the major bend in the Huangpu River, giving a spectacular view of the Pudong skyline and all the boats gliding by in the water outside. The terrace is stylish decorated with a very open and airy feel and here you can enjoy well mixed signature cocktails, chilled wines, rare whiskeys and a selection of light dishes. Perfect venue for some fancy and relaxing sunset drinks. The Ritz-Carlton Shanghai, Pudong holds several different restaurants and bars, but it is the 58th floor Flair Rooftop Restaurant & Bar that is the real flagship. 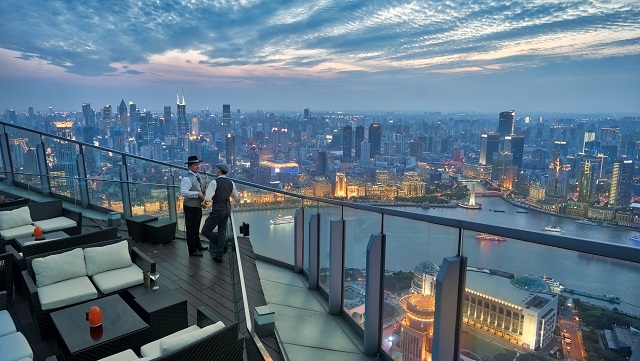 The highest rooftop bar in China, offering a fantastic view of Shanghai. Both a cool close up of the Pearl Tower, and being one of few rooftops on the Pudong side, some rare views of the Huangpu district. Get comfortable in one of the lounge sofas, enjoy a large set of creative and well made signature cocktails along with tapas-style dishes from all of Asia and front row seats to what feels like all of Shanghai. 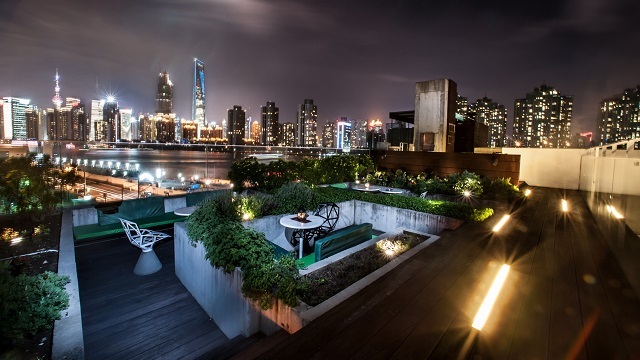 Located on the banks of Shanghai's Huangpu River and not looking like much to the world from the outside, here you find both a lovely boutique hotel and cosy rooftop bar. A hidden gem, offering creative cocktails and bar snacks along with a wonderful view of the Pudong skyline and the river. Not the highest or fanciest terrace in Shanghai, but a great choice for a calm and relaxed atmosphere here with nice lounge music and prices that are more affordable then on rooftops in Shanghai in general. From this roof terrace you get a magical view of the Pudong skyline, the Huangpu river and the surrounding skyscrapers. 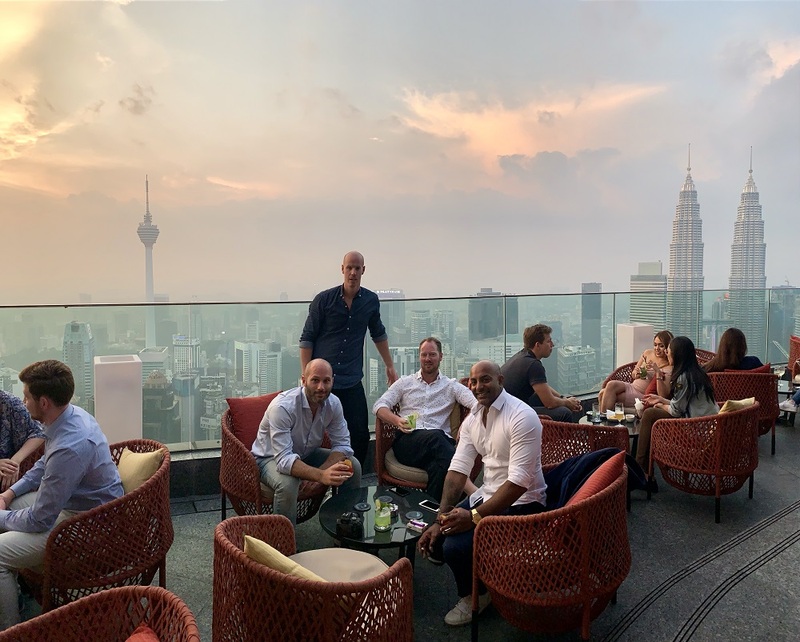 The rooftop bar is connected to the very popular restaurant Shook! one floor down, and serves tasty cocktails and bar snacks. Visit after dinner or just pop up for a drink and enjoy the skyline light show. Large and airy terrace and an atmosphere that is usually relaxed and harmonious, with a 'cocktail bar feel'. The Char Bar & Grill holds the top three floors of the Hotel Indigo, located riverside at Shanghai on the Bund. The rooftop bar is on the 30th floor and up here you get unobstructed and amazing 270 degree views of the Huangpu river and the Pudong skyline. While the indoor restaurant is known for their excellent steaks, the rooftop bar serves a wide selection of creative cocktails along with a distinctive wine list. Vibrant and popular, so be in good time to catch a view spot right at the edge. Bar Rouge is a sky lounge in Shanghai, ranked as one of the city's best nightlife spots. To go with that, the rooftop terrace also offers absolutely stunning views across the Shanghai skyline. Modern and luxuriously furnished with drink tables, lounge sofas and speakers frequently pumping house music. The bar serves a good mix of cocktails, champagne and beer/wines. The vibe is a bit calmer on weekdays, but on weekends it is very popular and the atmosphere is party high, so make sure to reserve a table if you want to get in. An elegant and stylish Shanghai rooftop bar with a location giving unique and amazing views of both the modern Pudong skyline as well as the historic buildings on the Bund side. VUE Bar is large on the inside, with a rustic main bar and floor-to-ceiling windows. And while the open rooftop terrace is not that big, the decor with comfy daybeds and a rooftop marble jacuzzi is really grand. The rooftop bar offers a wide selection of wines, champagnes, beers, and they are also known for making some real mean cocktails. The atmosphere is usually sophisticated and on top, with live DJs spining records and a mix of local and foreign visitors. 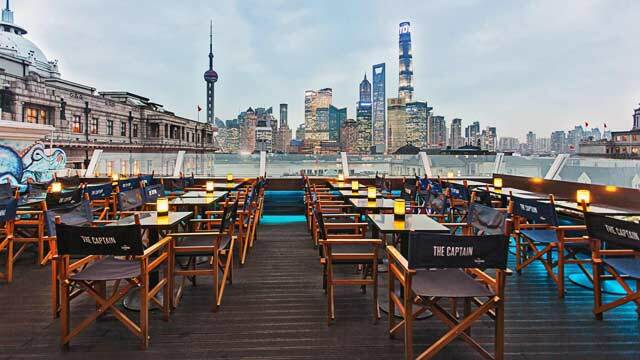 Newly renovated The Captain sits on top of Captain Hostel, with a premium location on the Bund. And while it is quite affordable compared to other spots with the same location, that is about the only hostel connotation you will find. Up here there is a Michelin chef preparing the food and a mixologist creating cocktails, all to some fantastic views of the river and the Pudong skyline. Enjoyed dinner and drinks both inside and outside, among a versatile crowd and a good vibe. Popular place, so be on time to catch a spot on the terrace. While many places claim to have the very best view of the river and Pudong skyline, we would argue that TOPS at Banyan Tree is the winner of the bunch. From this large and airy terrace you get unobstructed views of the complete skyline and over the river. Apart from fantastic views, TOPS also offers a stylish and sophisticated terrace with a gorgeous vibe. Sit down in one of the lounge sofas or park yorself in the large round bar and enjoy the contemporary drink menu, selection of nouveau tapas and some chill music. 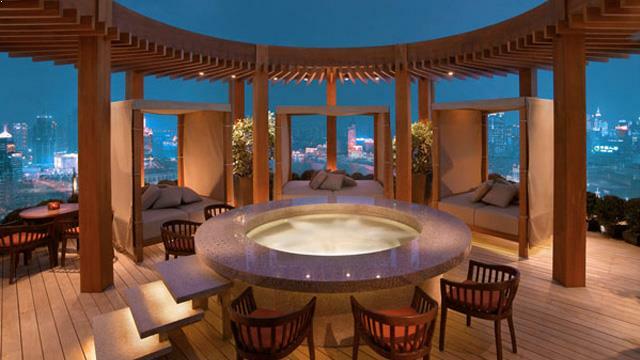 The perfect rooftop bar for a romantic drink. Discover the biggest collection of Shanghai activities, guided tours and skip-the-line tickets. Anything you want you'll find right here. Which are the best rooftops in Shanghai? 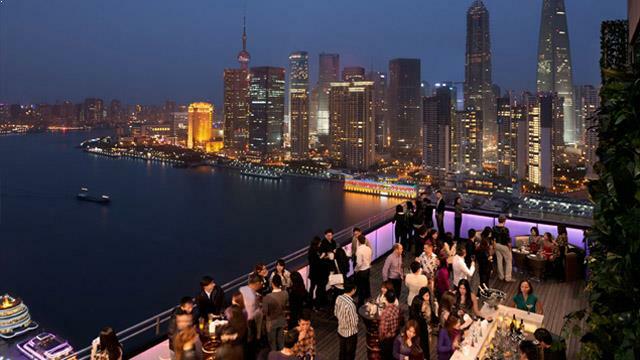 This complete guide will help you find the best rooftop bars in Shanghai. Like many other major cities in Asia, Shanghai has a very large city center with numerous skyscrapers stretching high into the sky. 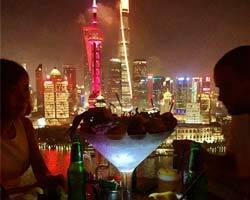 This means that the rooftop bars in Shanghai often have an absolutely magical view of the city and its skyline. The warm climate means the roof terraces can be visited all year round. The décor on the terraces are usually grand and luxurious. So expect higher prices than in other "normal" bars. 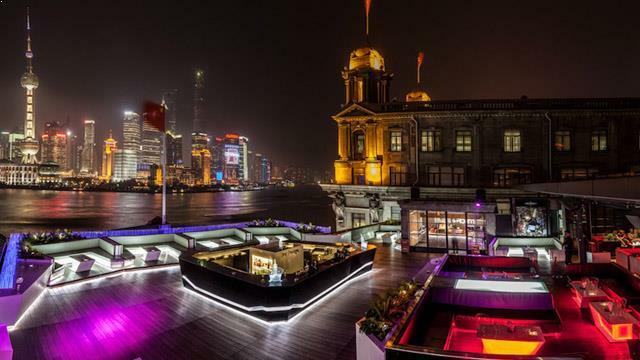 Most rooftop bars in Shanghai lies next to the Huangpu River. Almost all located on the western side of the river near the skyline of the towering skyscrapers. There are a lot of Shanghai rooftop bars. Considering the size of the city, it may take a little while to get between the different view spots - even though all are located in the central parts. A good way to move between the rooftops is by taxi It is very cheap to take a taxi in China and Shanghai. The views from some of the world’s best rooftop bars here are really impressive, and the only thing that can stop an ultimate rooftop experience in Shanghai, is the smog that can fill the air some days. 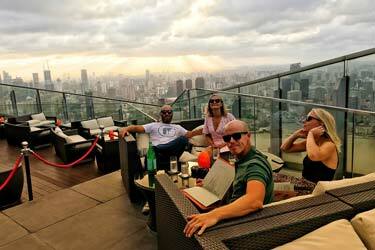 The typical Shanghai sky bar is located at high altitude and with a lovely view over the city skyline. Search on our map for the best sky bars in Shanghai, and you can find the ones closest to your location. Shanghai is China's largest city. 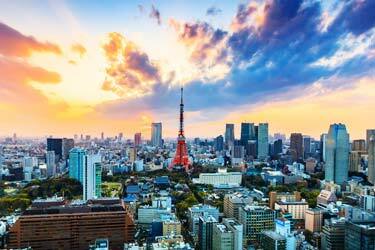 It is also Asia's most important financial center after Tokyo. Residents of the city have a very high standard of living compared to the rest of the population in the country. It also has China's largest and most important port area. Shanghai is a city with absolutely fantastic Asian food. Mainly considering Chinese food, but also regarding other food from the continent. This also applies on the rooftop bars in Shanghai. From the many roof terraces here you can eat superb food. Often in a very modern and luxurious twist. For those who are only looking to drinks at the rooftops, there is a good selection of classic cocktails at most rooftop bars in Shanghai. Shanghai is one of the world's largest cities. Which is something that is shown when it comes to the city’s party scene. 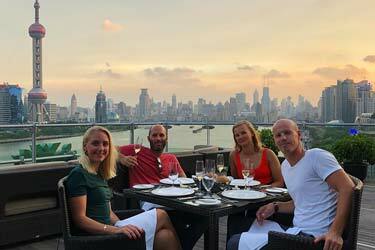 The party life has also embraced the rooftop bars in Shanghai, and in many of the terraces in Shanghai you can party and have fun until the wee hours.. When you're talking about height on the rooftop bars, Asia always tends to be at the forefront. And Shanghai is no exception. 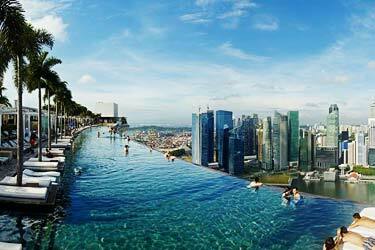 Here you can find some of the coolest and highest rooftop bars in the world. Or how about Flair at the Ritz Carlton on the 58th floor or the Vue Bar at the Hyatt, which both have a fantastic 360-degree view of the entire Shanghai and its skyline at a very high altitude. The outlook from the rooftop bars in Shanghai are usually of the city skyline and the mighty river Huangpu River. The views are really impressive just after darkness falls in and the city lights up in powerful colors from all the skyscrapers. For those who like to take nice pictures, this is a magical place. For a tourist, there are plenty of attractions in Shanghai. 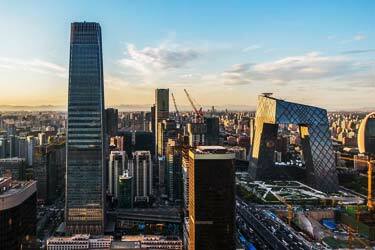 Here you can find a large number of towering skyscrapers as the Shanghai World Financial Center, Shanghai Tower and Jin Mao Tower. For those who like temples and museums, there is also a very good selection. For those who want to have awesome views without having to visit a rooftop bar, you can go up the tower Oriental Pearl Tower which is one of the tallest buildings in the city. On the street, the Bund can go and stroll and look in the shops. But beware, there’s a lot of people here every day. Service among people in Shanghai can be quite poor and most cannot speak English. So be sure to know where you are going before you set out on a journey of discovery. Shanghai Pudong International Airport is the largest airport in Shanghai and lies on the coast a short distance from the city heart. 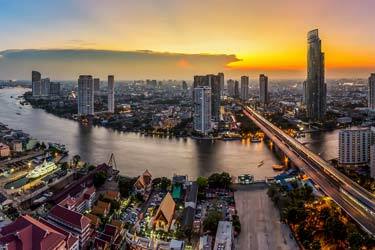 However, it is both inexpensive and easy to get around by taxi here, which makes it easy to go back and forth from the airport. In the newer Pudong district - where most of the newly built skyscrapers are – you can find some really luxurious hotels with absolutely magical rooftop bars. Despite the luxury found at many hotels here, the prices are very good regards to accommodations. If you want to get away even a little cheaper, there are a lot of options here that have good standard. 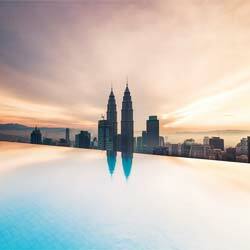 On our site you can easily book your hotel with a rooftop bar and take part of the best prices available on the market.